Fortunately, Section 4750.10 does explicitly define what constitutes a permissible “clothesline” or “drying rack.” The term “clothesline” includes “a cord, rope, or wire from which laundered items may be hung to dry or air.” The term “drying rack” means “an apparatus from which laundered items may be hung to dry or air.” The use of a “balcony, railing, or other part of a structure or building” does not qualify as either a clothesline or a drying rack. (See Civ. Code § 4750.10(a)-(b).) 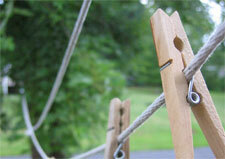 Thus, an owner may not simply hang clothes over balcony railings, building walls, etc. and claim that doing so is permissible under Section 4750.10. Section 4750.10 contains two (2) references to the term “backyard,” including a statement that Section 4750.10 “applies only to backyards that are designated for the exclusive use of the owner.” (Civ. Code § 4750.10(d)(3).) However, the term “backyard” is not so easy to apply in the context of modern residential developments and condominium projects where a unit’s “backyard” is not necessarily located in the rear or “back” of the unit. How then should HOAs treat situations where an owner wants to use a clothesline or drying rack in a side patio or front courtyard? Unfortunately, Section 4750.10 does not provide clear guidance on this issue. However, guidance may be found with reference to other provisions of the Civil Code. For example, Civil Code Section 4750 was recently added to grant protections to owners within HOAs seeking to use their yards for personal agriculture. Section 4750 uses the term “yards” which are designated for the exclusive use of an owner (not “backyards”). Thus, an argument can be made that if Section 4750.10 was intended to apply to any yard/patio designated for the exclusive use of an owner, the term “backyard” would not have been used. That argument would be supported by the analysis and legislative comments on AB 1448 that were generated after the bill was initially proposed and before it was ultimately approved. The California Senate specifically requested that AB 1448’s language be amended to specify the term “‘backyard’ (as opposed to ‘yard’).” (See Assembly Floor Analysis (9/9/15).) Moreover, the intent to limit clotheslines and drying racks only to “backyards” was noted by the Senate Judiciary Committee: “[AB 1448] would not preclude [HOAs] from restricting the use of clotheslines in other areas of a separate interest, like a front yard, or in common areas.” (See Senate Judiciary Cmte Report (7/7/15).) A HOA Board that is unclear on this issue should consult with their legal counsel as to what areas of a separate interest or exclusive use common area in their particular community should be considered a “backyard” for the purposes of Section 4750.10. Section 4750.10 does not entirely strip a HOA of its authority to impose restrictions on the use of clotheslines or drying racks. Section 4750.10 allows for HOAs to impose “reasonable restrictions on an owner’s backyard for the use of a clothesline or drying rack,” where “reasonable restrictions” are defined as restrictions “that do not significantly increase the cost of using a clothesline or drying rack.” (Civ. Code § 4750.10(d).) However, unlike in the context of solar panels, the Civil Code does not specify what exactly constitutes a “significant” increase in cost for the purposes of Section 4750.10. Section 4750.10 also does not prohibit a HOA “from establishing and enforcing reasonable rules governing clotheslines or drying racks.” (Civ. Code §4750.10(e). ) Unfortunately, Section 4750.10 fails to provide guidance on specifically what a “reasonable rule” would look like. Some help may be found with reference to the other Civil Code Section that will be added as a result of AB 1448: Civil Code Section 1940.20. While Section 1940.20 pertains to a tenant’s use of a clothesline/drying rack, a tenant’s right to do so is made subject to various conditions. Those conditions include the following: not interfering with the maintenance of the property, not creating a health or safety hazard, not blocking doorways, not interfering with walkways, not affixing to a building without the landlord’s consent, not violating reasonable time or location restrictions, and obtaining the landlord’s consent. (See Civ. Code § 1940.20(b).) Thus, any rules that a HOA imposes which are modeled after these conditions are likely to be seen as “reasonable” and consistent with the legislative intent underlying Section 4750.10. As stated above, Section 4750.10 will create questions that are not so easily answered with reference to the statutory language itself. HOA Boards and management professionals that are concerned about the use or potential use of clotheslines and drying racks in their communities should consult with their legal counsel for guidance.